Hibernate is one of the most popular Object Relational Mapping (ORM) framework on the market which helps in map Java objects with relational database in object-oriented programming. 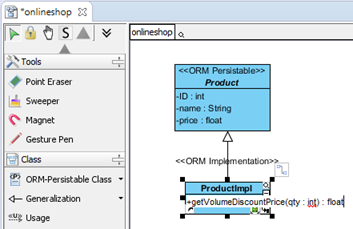 With Visual Paradigm you can generate Hibernate source code from UML class models and Entity Relationship model for building database applications. For most of the case the generated Hibernate source code are just used out-of-the box as the persistence layer and developers can building business logic for their applications on top of it. But in some case developers may want to add simple business logic to the generated persistence layer to ease their job. To do this we can extend the functionality of the persistence layer by defining custom implementations. 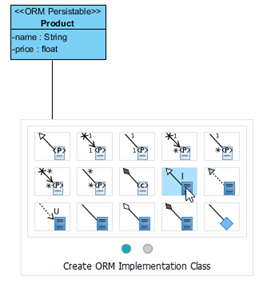 In this tutorial we will show you step-by-step procedures to define custom implementation for ORM classes. 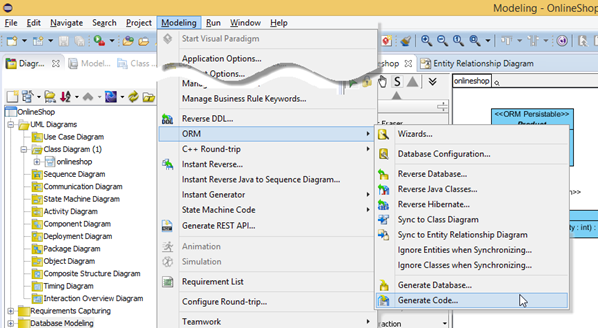 Visual Paradigm, Eclipse Mars.1 and Microsoft SQL Server will be used in this tutorial. Click on the Product class and drag out the resource icon. Release the mouse button on the desire location in the diagram. 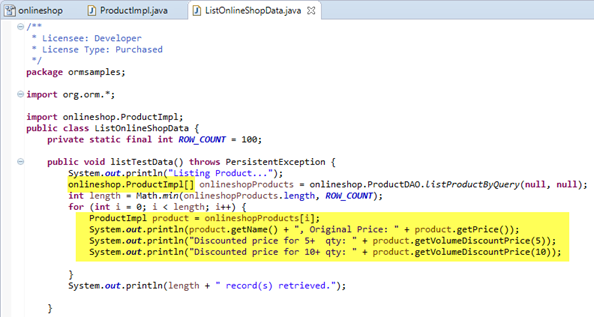 Select Create ORM Implementation Class in Resource Catalog..
Name the created class as ProductImpl. Right click on ProductImpl and select Add > Operation. 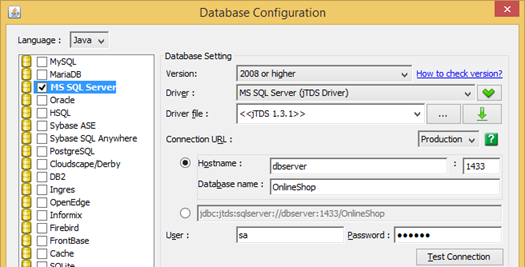 Select SQL Server as our default database. Specify the connection details to the SQL Server. Use the Test Connection button to make sure your configuration detail works. Then press OK to close the Database Configuration dialog. 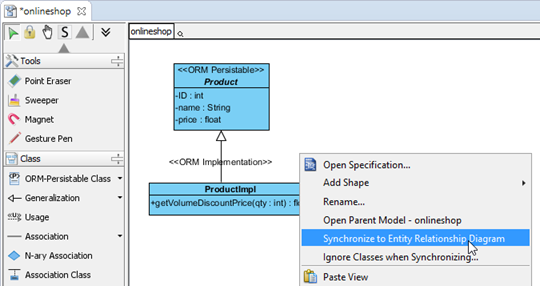 Right click on the blank area of the class diagram and select Synchronize to Entity Relationship Diagram, follow the wizard to perform the synchronization with default settings. The ERD for our model is generated. To simplify the testing we can predefine some sample data for our database. 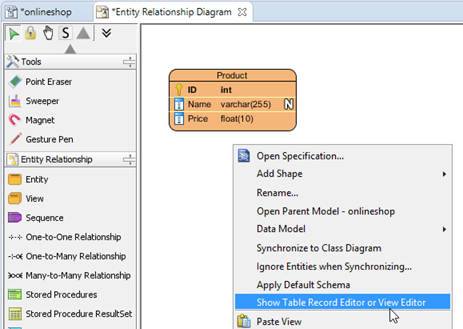 Right click on the blank area of the ERD and select Show Table Record Editor or View Editor. Enter the sample record below to the Table Record Editor. 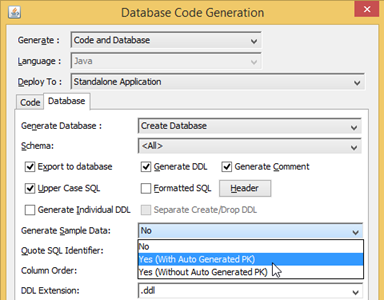 In Database Code Generation dialog, select generate Code and Database. Select Generate Sample Code so that we can test the implementation with the generated testing program. Press the Advanced Settings button. In the Advanced Settings dialog, select ORM Implementation as Persistent API return type. 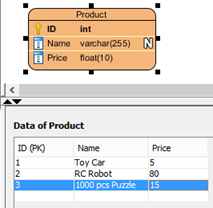 Switch to Database tab and select Export to database. Select Yes (With Auto Generated PK) in Generate Sample Data. Press OK to proceed code generation. 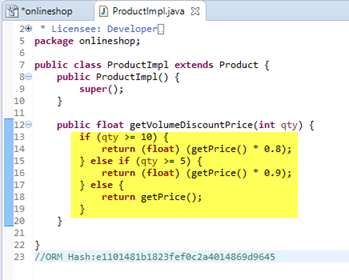 Now the Hibernate code are being generated, and we can start define the custom implementation in the getVolumeDiscountPrice method. i.e. we offer 10% off for purchase 5+ copies, and 20% off for purchase 10+ copies. Done. 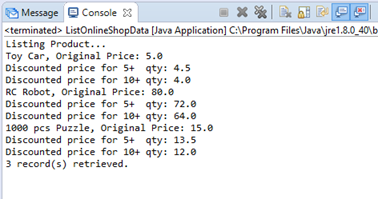 Let's modify printout section in the list data sample to test our custom implementation. Run the modified list data sample and the custom implementation method was being called.